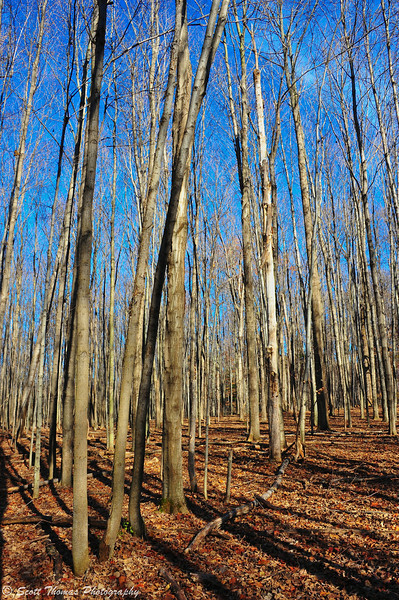 An atypical November day in a forest at Beaver Lake Nature Center near Baldwinsville, New York. Nikon D700/28-300VR, 1/50s, f/18, ISO 200, EV 0, 28mm focal length. The local weather guy had to go back 51 years to find another November which had 4 warm and sunny days in a row. Incidentally, that was the year I was born. 🙂 I sure could not let such a run go by without enjoying a walk at the nearby Beaver Lake Nature Center. I took the same trail I did back in early May to see what late autumn might hold in store for me. Don’t forget about the current photo assignment as photographers are starting to post their photos of Autumn 2010. Red berries against a blue November sky. For Disney fans, look for the Hidden Mickey. Nikon D700/28-300VR, 1/250s, f/8, ISO 200, EV 0, 300mm focal length. 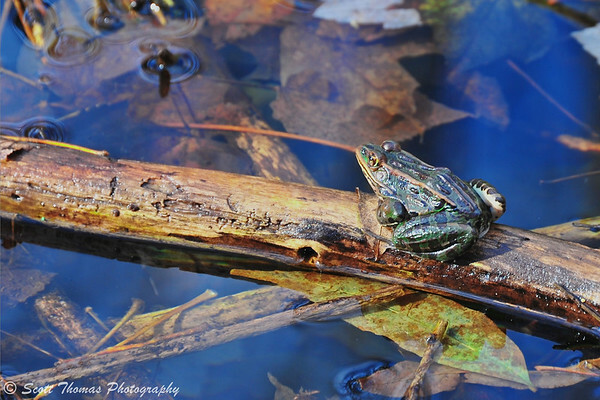 Leopard Frog enjoying the late November sunshine along the shore of Beaver Lake. Nikon D700/28-300VR, 1/60s, f/7.1, ISO 200, EV 0, 300mm focal length. This entry was posted in Nature, Weekly View and tagged 28-300mm, amphibian, baldwinsville, beaver lake nature center, berries, blue, leopard frog, new york, nikon D700, november, red, shadows, sky, trees, vr. Bookmark the permalink. The Leopard Frog is wonderful – I can even see the slickness on its skin and the bark of the log. Do you use a tripod for these zoomed shots? Nice captured of the frog. I heard that they don’t eat as much during the winter months, I guess not moving around as much also. We still have plenty of leaves on the trees, but the colors are getting darker. The frog was a surprise. He seemed very content to soak up the sunshine. Being an amphibian, frogs are cold-blooded and can not regulate their body temperatures so I am not surprised they slow down in the cooler months. Up here they will hibernate through the snow and cold of our winters. Wow, your trees are BARE!! I still see lots of green when I look out the window. 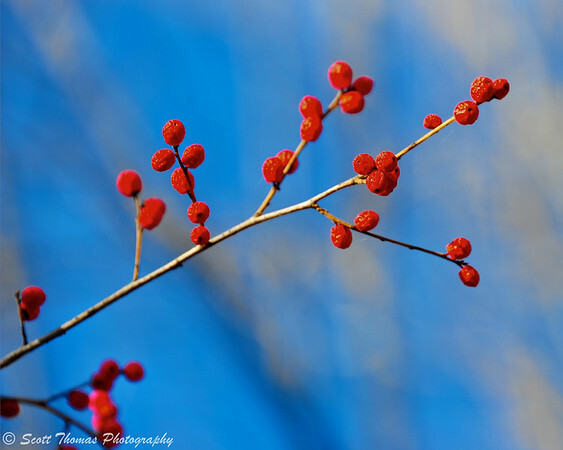 I like the berries, the bright red against the blue sky is so pretty. Yep, most of the hardwood trees are now bare with the willows and beeches holding on as they do each year. That top photo looks exactly like the view out my kitchen window – except that we are having seasonably gray weather. Nice late autumn shots. I even found Mickey! What a great frog! I’m surprised to you could find one this late in the season, even on a warm, sunny day. All of our frogs seem to have disappeared for now. Me, too. I suspect by the end of this week, he will be nowhere to be found as well. I’m starting to wish my trees looked like those! Did you see the pic I shared on FB yesterday by any chance? Did you notice the illusion in the frog shot? It is kinda cool – there is a twig in the water that is in line with the ridge on the frog’s back – gives it a Steve Martin “wild and crazy guy” kind of feel, LOL! Or I could be completely wrong in that interpretation! I checked it out, Karen. Yep, I got piles of leafs waiting for the town DPW to come and pick up. They seem to be very late this year. LOL I see what you mean with the twig and frog. This time of year, the Sun angle really scatters the light in our atmosphere leaving a deep blue sky. Since I am headed home toward those bare trees, you are providing a preview of what the Upper Peninsula looks like now! I adore your frog. Sounds like lots of folks adore the frog! Autumn has seen its glory and now is down to bare bones.